Every Ramadan I try to remember what I did last Ramadan. I'am 28 years old, which means I've memories from 27 Ramadan hidden somewhere. I can't remember most of it. I can't remember what I did yesterday to remember what I did last year! haha! Long story short, I would like to Journal My Ramadan this year. Yes, through photos and journals. I got the idea from Ali Edwards' December Daily and have been looking forward to Ramadan this year to give it a go. Playing with Fatmumslim's Photo A Day June gave me just the boost I wanted. I loved the idea of having a list of prompts ready as I find it difficult to come up with ideas for photography or journalling every day in a mundane life like mine. So I combined both the ideas together (December Daily and Photo A Day) and made this list of prompts. I'am planning to take photo(s) based on the prompt or journal about the matter. I might do both or either. I know Ramadan gets really hectic and keeping a journal could be hard. But if we plan ahead, I think we can do it. And it's not necessary that we have to do everything offline. We could always, take photos or write on our blogs and put it all together in an album later. I'am planning to use Pretty Paper Studio's Ramadan Journal Kit to preserve this year's Eid memories. I'am also planning to purchase Documented: Mix and Match 6x8" Album with some extra Page Protectors from Simple Stories. I should have bought it by now. But that's ok. I will start making some foundation pages and fill them in the album once it reaches here. I will try my best to put up a blog post everyday during Ramadan (I'am no Ali Edwards :P). I will leave a link manager under each post so that you can link up yours. You can also follow me on instagram (@nielouphar) or on twitter (@nielouphar). Or to make things even more simpler, you could also tweet or instagram about your posts/photos with #ramadanjournal. If you need any more info, please drop a comment here. I would be really happy to hear your thoughts and comments. This is a personal journey I'am planning to take this year and your encouragement will mean the world to me. I've kept the prompts general so that everyone can play (thanks for the idea Riri). For prompts that can be slightly Islamic, I've given a second option (after forward slash), which you could use in case you find the other one difficult to follow. 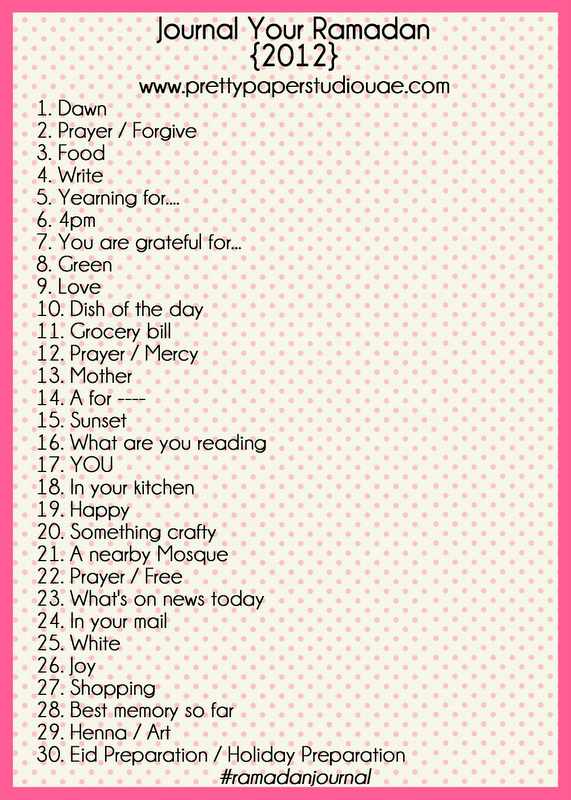 I just took a look at your wonderful blog, the Ramadan Journal idea looks great and I have saved the list of themes for each day, although I suspect I will end up deviating a little from many of them. It will also help me to refelect on each day of Ramadan and be a bit more thoughtful about wwhat I am doing each day. Thanks for letting me know, this should be interesting. Thank you for dropping by. Please feel free to use the list in whatever way you would like to. :) Looking forward to seeing you more on my blog. Salaam, Neelu. What a lovely idea. I will be checking back this month to see how your Ramadan is going. Ramadan Kareem to you! Walaikumussalam Holly. Thank you :) Do check in. Ramadan Kareem!